Attention-Deficit Hyperactivity Disorder (ADHD) is more likely linked to residential altitude than community water fluoridation (CWF). This finding calls into question a recent paper claiming ADHD is linked to CWF. A paper that is being heavily promoted on social media at the moment by anti-fluoridation groups. I discussed problems with that paper, (Malin & Till, 2015) in my article More poor-quality research promoted by anti-fluoride activists. Now I have taken my critique further by making my own exploratory investigation of likely influences on the prevalence of ADHD in US states using the approach of Malin & Till,(2015). Except I did not limit my investigation to CWF data but also included state prevalence data for other likely influences on mental health. One of the best correlations with ADHD state prevalence I found was with elevation data for each state. 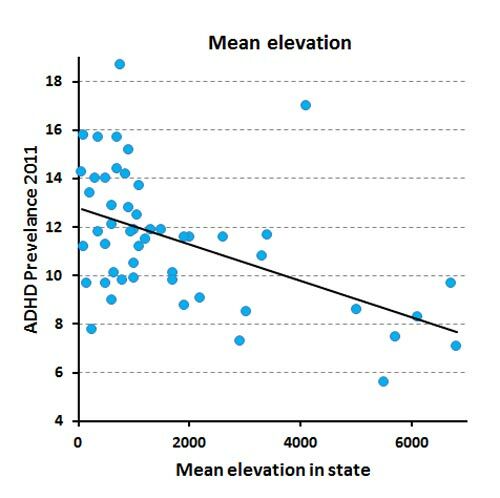 It’s a negative correlation – the higher you go the lower the prevalence of ADHD This figure shows the correlation of ADHD state prevalence in 2011 with mean elevation for the 51 states. It is statistically significant with a correlation coefficient (r) of -0.5 and significance (p) of 0.00. For comparison, the similar correlation of ADHD state prevalence in 2011 with prevalence of CWF in 2010, while significant, has a correlation coefficient of +0.32 and significance of 0.02. However, the correlation with CWF is not significant in a multiple regression with elevation – see below. My exploratory statistical analysis showed a number of other factors significantly linked to ADHD with correlations similar to, or higher than, CWF. Images for the data and a table of correlation coefficients and their significance are shown below. The correaltion of ADHD state prevalence in 2011 with home ownership and % living in poverty are better than with CWF. These correlations are positive – the prevalence increases with % home ownership and % of people living in poverty. I guess it is hardly surprising that mental health problems would increase with the amount of poverty. But perhaps in the US home ownership is also not conducive to mental health? The correlations of ADHD state prevalence with educational attainment (Bachelors degree) 2009 and Per Capita personal income 2010 were similar to that with CWF. These correlations are negative – I guess its easy to understand that higher incomes and better education is conducive to better mental health (lower prevalence of ADHD). The correlation of ADHD state prevalence with the proportion of the sate’s population older than 65 was also similar to that for CWF. 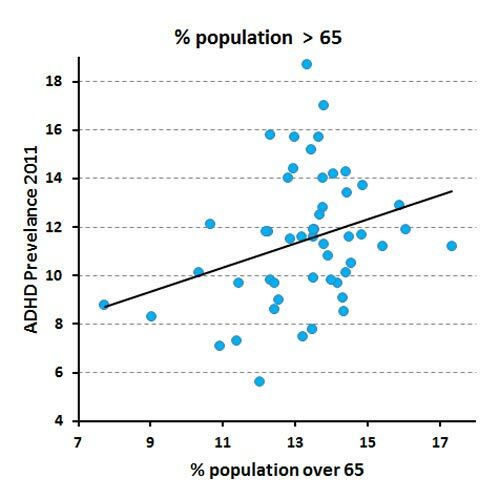 The correlation is positive and one can only speculate on reasons for the increase of ADHD prevalence as the proportion of older people increases. The table below summarises correlation coefficients (r) and statistical significance (p) for the figures above. CWF in 2010 is correlated with mean elevation – correlation coefficient r=-0.43 and significance p=0.002 – suggesting these are not independent variables. (CWF in 1992 was similarly highly correlated with mean elevation.) Perhaps Malin and Till (2015) only found a correlation of ADHD with CWF because they are both related to mean elevation. Multiple regression analysis suggests this is the case. The statisitically significant factors were mean elevation (p=0.001), home ownership (p=0.000) and poverty (p=0.005). The contribution of CWF in 2010 was not statistically significant in this multiple regression (p=0.587) as were most of the other factors I considered. Malin and Till (2015) use the CWF for 1992 in most of their comparisons. My analysis shows this has a better correlation with ADHD prevalence in 2011 than CWF for any other year (r=0.45 cf 0.32 for CWF in 2010). 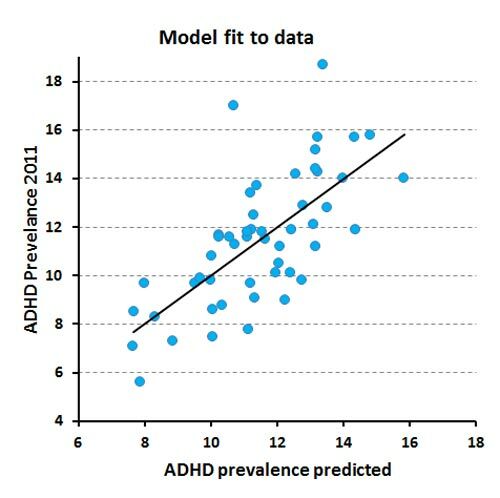 It seems strange to use 20 year old data in a model predicting ADHD prevalence for 2011 so I used more recent data for my exploratory analysis. However, in a multiple regression the contribution from CWF in 1992 was still not statistically significant (p= 0.158). We should be careful of conclusions arising from such exploratory investigations. Firstly the obvious – correlation is not causation. But secondly the choice of data is crucial. Malin and Till (2015) chose to consider CWF prevalence as the main factor influencing ADHD prevalence. They did also include socioeconomic status (SES) as a secondary factor. However, my analysis shows a number of other factors which could equally be considered. And when they are considered in multiple regressions the contribution from CWF is not statistically significant. The model used by Malin and Till (2015) using CWF in 1992 and SES in 1992 explained only 31% of the variance of ADHD prevalence in 2011. The corresponding firgures for ADHD prevalence in 2003 and 2007 were 24% and 22%.) But using a model for the influence of mean elevation, home ownership and poverty only (no CWF included) I was able to predict the state prevalence of ADHD in 2011 as shown in this figure. This accounts for 48% of the variance and has a significance of p= 0.000. Perhaps further exploration of the available data could produce an even better model but the key point here is that CWF does not contribute anything once mean elevation is included. Ken, you have made a huge miscalculation here. You’ve applied common sense and valid scientific method to an antifluoridationist claim. We all know that these parameters do not pertain to antifluoridationists. Ken, you have failed to include a number of other parameters that confound your conclusion. e.g. What side of the bed people sleep in, do they wear pyjamas, do they shower before breakfast or after, to cite but a few. The main one missing however is GAS or grasping at straws. A few scientists (and dentists) facing the demise of the evidence supporting their historic stand adopt GAS as their last line of defence. Trevor – you criticism of my consideration of a relatively small number of factors of course applies even more strongly to Malin and Till (2015) who considered only fluoridation and SES. The fact is if they had included just one other factor, mean state elevation, they would have found no significant relationship of ADHD wiht fluoridation at all. This arises because of the strong relationship between mean state elevation and incidence of CWF. As I said in my previouus article there was a possibility that their fluoridation data was actually a proxy for something else. My statistical analysis shows this to be the case. I am not advocating any specific model (although mine is far more effective than Malin and Till’s). I did very little collection of data and would actually collect more for a serious investigation. The purpose of my article is simply to show the dangers of the ecological approach they used – especially when combined with biased literature citation and fixation on a specific hypothesis. In this case I would add another factor is the incestuous nature of the peer-reviewers and journal editor and associate editor – all demonstrating a similar fixation on chemical toxicity and ignoring other possible mrchanisms. The peer review reports are, in my view, quite inadequate. Mind you that won’t stop anti-fluoride activists promoting the paper – even if it comes back to bite them on the bum as their promotion of Bill Hirzy’s since discredited paper did. Greenbuzzer – strange then that the evidence does not support you claim. 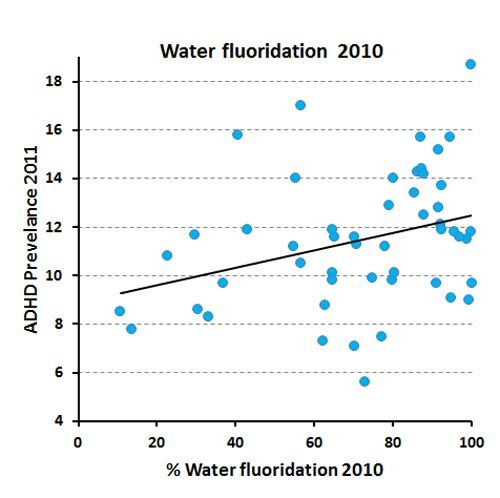 There is no significant relationship of ADHD with fluoride when the strong dependence between fluoridation and mean elevation is taken into account. Ken I am glad to see you are eventually looking at correlations to see what might be happening without saying as you did recently that you must have a hypothesis first. Of course that runs into trouble with lower p values since at 0.05 one in 20 results will occur by chance. But here you seem to have some good p values. You offer the same figure of 0.32 for in your table of correlations as you do in your section on multiple regressions. I hope this discussion isn’t just going to be about proof or disproof of an issue but a basis for further investigation of all those correlations you have brought up. I know that will be a problem of thought but I hope we can make the effort. I have an anecdote to add and I know they are no use by themselves but I hope some genius can make use of many anecdotes with the software available these days. That anecdote is someone who says he gets hyperactive unless he can avoid non-distilled Christchurch water. You have brought in altitude and in Sweden the west is a few hundred meters higher the east, and the higher altitude has softer water. This study is about lower risk to heart health with harder water. But they would need to allow for a factor where people nearer the coast get more protein from fish rather than milk. Therefore they would get more vitamin D.
I don’t know if in the high latitude of Sweden whether the slightly higher altitude is going to expose people sufficiently to extra UVB to make more vitamin D. But in the USA it would do. more severe form of ADHD, the hypothesis has been advanced that lesser vitamin D level of the Black boys could predispose them to neurological troubles. Blacks also may have more lactose intolerance therefore may use less milk which is vitamin D supplemented in the USA. Vitamin D also improves dental health. I would be very pleased to see your table of the multiple regressions/partial correlations clarified relating to the table you gave which may be simple correlations? Then I would be very interested to see a further two tables of your set of figures done (a) in the “natural” fluoride areas, then (b) in the adjusted or fluoridated areas which likely have lime added for pH adjustment. I am hypothesising altitude could have a greater effect in the naturally fluoridated areas, if I remember 0.1 to 35.9 ppm, since the water at the lower altitude has normally run through more ground and picked up minerals like fluoride, in addition to hardness. I also noted that they were doing the study of ADHD some years after the fluoridation data they used. I thought that would allow for pregnancies in the areas being taken into account, even moving towards second generation. When you start looking around.The knowledgeable people are already saying the findings were overstated and the study poorly designed. said the paper failed to take these confounding factors into account, despite the existence of statistical tools for doing this, and there were many things that hypothyroidism may be related to that the study was not picking up on. Brian, I think my comment about hypotheses was that one should not be biased by them as these authors were, as as were Choi and Grandjean. Why do you feel the need to comment on the fact that I gave the same value of 0.32? I was referring to exactly the same analysis. Yes, the table is of simple correlations. The data I give for p values in the section on multiple regressions refer to the models specifically considered and the percent of variance explained relates to the overall multiple regression correlation coefficient. No, I am not interested in investigating these factors further – my purpose was simply to underline the original criticism I made of this study relating to fixation on a single hypothesis and ignoring of confounding factors. You yourself are quite welcome to spend your time on investigating the individual factors further. The reason the authors chose for using the 1992 fluoridation data had nothing do with pregnancies. It was simply because they wished to differentiate between natural and “artificial” fluoridation (declared) and presumably because the correlations we’re highest for 1992 (not declared). chris price: ““It’s only in situations of iodine deficiency that you’ve got a problem with fluoride excess,” Professor Eastman said, taking issue with the paper’s discussion of iodine levels in the UK population. They are mainly just taking swipes and not looking constructive, a great discredit to science. They should acknowledge tails of distributions to have any credibility. Then they should also look at how iodine deficiency may be related to tooth decay, and whether fast food and bread manufacturers were using iodised salt. And I should think Ken’s figures would do well to include a latitude analysis since as well as altitude latitude is related to vitamin D. A confounding factor may be more Blacks in the south. Therefore we are totally justified and dignified in going on just as we are? Actually we are moving slowly into the light despite your protestation everything is just great. It varies between doctors how well they advise patients to watch for side effects, since they know the strong effects of placebo which is often a large factor in a treatment and they do not wish to undermine that. Therefore they should have independent monitoring and requiring patients to check back. They should not wait till symptoms rise so bad as to require a further medication. We have more recognition of various food intolerances, lactose, gluten, high GI, peanut, kiwifruit, banana, egg, &c. and are starting to treat by removing the offending substance rather than dosing the patient on drugs. Your article has acknowledged low iodine may cause less fluoride tolerance. So as not to look backward that should be more attended to by DHBs. Yes it is interesting, Chris. Women withdrawing from the placebo arm of a hormone replacement therapy trial got quite a percentage of the withdrawal symptoms that the women who been on the actual treatment for a number of years did. (Wiki placebo). Tomato plants can be caused by signals relayed by soil micro-organisms to be ready for an above ground pest attack that has not got to them yet. Same I think with humans possibly. Placebo can be a large percent of the effect of a conventional drug, therefore psychological effects are to be expected for other things like the ocean radiation coming from Fukushima to USA. The analysis has to allow for it, and authorities should not say then blah blah they don’t have to bother, because there is some psychological factor. Shame on them! So I’m going to have to find another reason for the reduced football selections/performance from fluoridated areas. Brian – you asked about other factors – it is quite easy for you to check that out but I have done so for Latitude and race as you suggest. ADHD prevalence in 2011 is not significantly correalted with latitude (r=-0.17, p=0.226) but is with longitude(r=+0.40, p=0.003). However, neither of these add a signficant contribution to the multiple regression. There are significant correlations with several sets of race data (Non-hispanic white and Black are positive, the others negative). But the only one that comes close to a significant contibution (p=0.07) in the multiple regressions is a negative correlation for Hispanic/Latino. Thanks very much Ken, I presume you removed the minus sign from the longitude, meaning the greener east and presumably river water is associated with less ADHD than the dry west and more well water. Hispanics have tended to be Catholic adherents and possibly more attend church schools and do confession rather than having to face the world themselves. It is hard to know whether that would change reporting or in some cases make a life with more routine which may help kids, note the Montessori schools here. I am not sure about the “Mediterranean” diet and its range of nutrients but it has been claimed to be quite good so a bit extra fluoride might not be so important amongst the wider variety of other things. The latitude effect needs to be controlled for Hispanics who will be more prevalent in the south. Not sure if your regression comment means you did that. I am just learning this but the Mediterranean diet tends not to have potatoes. Potatoes contain a glycoalkaloid called solanine in varying amounts. Solanine is an inhibitor of acetylcholinesterase, and Westendorf and Knappwost said fluoride is too. “Rats with fluorosis also tend to have significant decreases in neural nicotinic acetylcholine receptors (nACHRs) and inhibited [I add: acetyl]cholinesterase expression. So a potato-free diet would have less of the burden on those mechanisms, and fluoride’s effect then not so likely to be the last straw. Need to look at the tails of the distributions. Do you mind if I quote a few of your articles as long as I provide credit and sources back to your website? My blog is in the exact same niche as yours and my users would definitely benefit from a lot of the information you present here. Please let me know if this okay with you. Many thanks! Sure Terrell – use what you want.